The Diamond-z4 from the Sterling Collection is a cubic zirconia ring that captures the spark and beauty of flawless diamonds on one of the famous ring designs in the world. Even many jewelers have a hard time telling the difficult between the Diamond-z4 CZ stone from genuine mined diamond because of their similarity. So if many trained jewelers can’t tell the difference, why would anyone else can? The Diamond-z4 ring is a true masterpiece being offered at an unprecedented price. You can get the fire and brilliance of a flawless diamond ring without having to pay thousands of dollars. Each Diamond-z4 ring contains 4 carats of total weight. 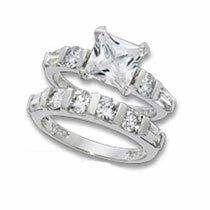 The center stone is a simulated diamond that is 2 and 3/4 carats with a flawless princess cut. It is surrounded by round and tapered clear Diamond-z4 baguettes that total 1 and 1/4 carats. The stones are set on a polished and finished sterling silver plate. One jeweler that examined the Diamond-z4 ring complimented on how flawless the stones were and was shocked that they weren’t actual diamonds. Each Diamond-z4 Ring comes with a hinged decorative velveteen box and includes a certificate of authenticity. It sells for $20 plus the cost of shipping and hanlding. Plus as a special bonus you can also add a matching 1.9 total carat Diamond-z4 Band with your order for free. You just have to pay a small additional shipping and handling fee for it. One Comment on "Diamond-z4 Ring"